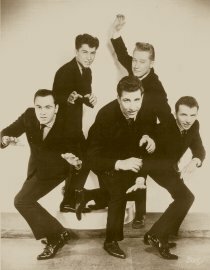 The Chants, 1960/1, left to right: Pete Antell (guitar and vocals), Bobby Butts (sax and vocals), Mike DeVivo (lead vocals), John Linde (drums) and Mickey Lee Lane (bass). 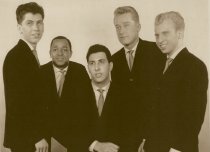 The Chants, 1961/2, top row, left to right: Pete Antell and John Linde; bottom row, left to right: Al Ferreira (tenor sax and vocals), Mike DeVivo and Curly (bass and vocals). The American Twisters in Milan, Italy for the movie Mondo Caldo Di Notte, 1962, left to right: John Linde, Pete Antell, Curly, Mike DeVivo and Al Ferreira. The Valrays, 1963, top to bottom: Rod McBrien, Benny Palmeri, Bob Musac and John Giametta. The Valrays, 1964, top to bottom: Rod McBrien, John Giametti and Bob Musac. 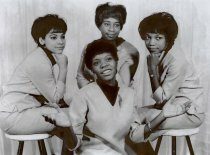 The Percells, 1963, left to right: Jean Marie Johnson, Joan Paulin, Betty Lloyd and Gail Jones. 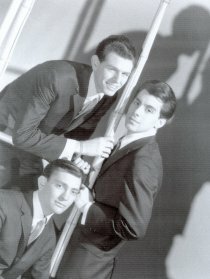 The Trains, 1964, left to right: Bobby Bloom, John Governali and Bob Kneiper. They say a picture is worth a thousand words. The publicity photo shown above is a good example. It was taken in 1963 at Limelight Casuals, a clothing store situated in the Walt Whitman Mall in Huntington, Long Island, New York. Standing are drummer-songwriter John Linde, keyboardist Stoney Jackson and guitarist-songwriter Pete Antell. 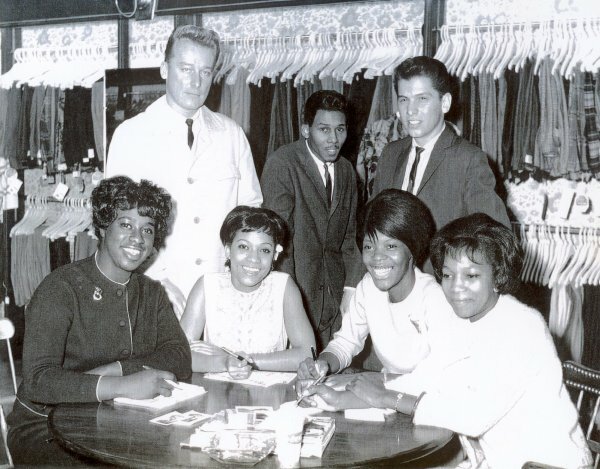 Seated at the table in front of them are vocalists Joan Paulin, Jean Marie Johnson, Gail Jones and Betty Lloyd, collectively known as the Percells. What follows is their story. THE PERCELLS was the dream of Gail Jones, their lead singer. Gail grew up singing gospel, while still appreciating rhythm and blues: "I started singing when I was about ten years old. My grandmother was a singer. She sang with the Twilight Gospel Singers, who became one of the first African-American groups to carry gospel to Europe. She had passed away by the time they got there, though. As a little kid, I listened to LaVern Baker and Little Willie John." Gail decided that it was time to put together a singing group that she could call her own. She and her school friend, Jean Marie Johnson, formed a group just to have fun while exercising their vocal cords. Jean suggested her friend Betty Lloyd and Betty knew another girl, Joan Paulin, who came from a musical family. Joan, her three brothers and her mother all sang in church choirs. Her oldest brother, James, was the first African-American organist to play at Radio City Music Hall in New York City. The quartet started singing every day while walking home from school. As a result of this practicing, the young ladies became disciplined vocalists. It wasn't long before they began getting work, singing at local venues on Long Island such as Gibson's, Glen Cove and St. Alban's Terrace. They were also singing at most of the dances that were held in the area. This round of venues included The Celebrity Club in Freeport, where Joan's father was a producer and the master of ceremonies. He also became their legal advisor and manager, steering them into coveted spots like opening shows for notable artists like Lenny Welch. The group began traveling to New York City from Long Island to record demos, including a radio jingle for radio personality Magnificent Montague, then with WWRL. The group's name is a product of a touching scene from Gail's quest to absorb as much musical knowledge as possible: "There was a bar in the neighborhood that had blues bands. I used to sit outside because I wasn't old enough [to go inside]. One night, this guy was sitting outside next to me and he was singing along with the music. They wouldn't let him in either because he was very disheveled. He had one of the most beautiful voices I had ever heard. I asked him what his name was. His name was Percell. I told him one day his name would be in lights. He never lived to see that, but it did happen." 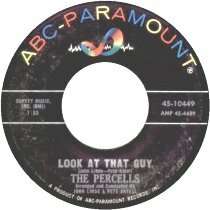 The talented Percells would soon cross paths with two equally talented singer/songwriters who would become their mentors. These guys were not older veterans, but fresh talent barely out of their teens. 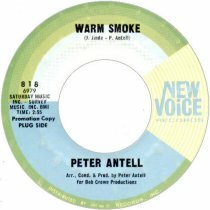 PETE ANTELL grew up as Peter Blaise Antonio in St. Albans, Queens, home to musical luminaries like Count Basie. When Pete was 10, his family moved to Levittown, Long Island. Pete took up playing the guitar. By the time he was in high school, Pete had expanded his musical horizons by writing his own songs. His first band was called Tony Leopard and the Spots. 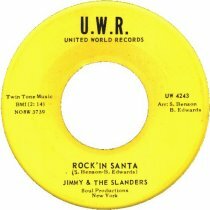 This band was fortunate enough to make several 45s as the backing band for the Charades and other vocal groups recording at Allegro Studio in New York City. The Spots became the Escorts, changing their name again to the Scarlets. The Scarlets recorded an instrumental for Dot Records entitled 'Stampede'. For Pete, there were other musical prospects fast approaching. JOHN LINDE was born and raised in Oceanside, NY. John started down the road to a musical career by taking part in the school band as a percussionist. 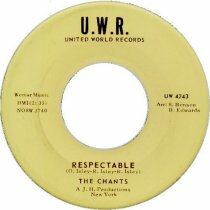 After graduation from high school and a stint in the armed forces, John resumed his quest for a niche in the music business by forming the Chants in 1959. John was the band's manager as well as their drummer. He diligently followed up on all possible avenues in order to work. Through John's contacts and his meticulous business acumen, the Chants began building a solid reputation as an excellent club band, establishing followings at various venues on Long Island. 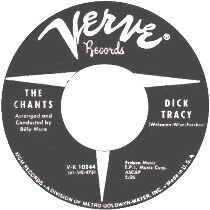 In 1961, the Chants hooked up with a family of fledgling recording entrepreneurs, Bill and Steve Jerome. They owned a small storefront recording studio and a label called Tru-Eko Records. 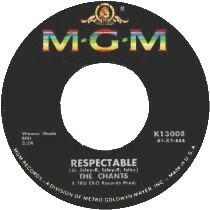 The Chants prepared to record a version of 'Respectable', a song written and previously recorded by the Isley Brothers for RCA. The Chants reworked the song to suit their style and began performing the tune as part of their act. After 'Respectable' was released, it became the winning pick on Murray The K's show. John relates the story: "'Back in those days, Murray The K had a boss record contest. Each day's winner would be played on Friday. That winner would go into rotation. We won the day, then we won the week." 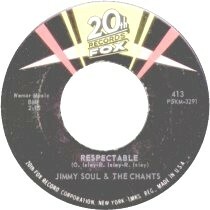 With 'Respectable' now in rotation on New York radio, demand for the record significantly increased. Since the Jerome brothers could not break the record on Tru-Eko without proper distribution, they leased it to MGM. 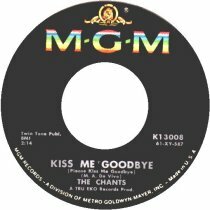 The Chants promoted the single and themselves through television appearances on The Clay Cole Show in New York and The Buddy Morrow Show in Detroit. John thought it best to handle the business affairs of the Chants by himself. Since their popularity as a club band was high, offers began coming in for the group to cut a production deal. John says that one particularly tempting offer came from Buena Vista Productions out in Los Angeles. Just as John was ready to accept this deal for the band, an offer from a booking agent in Milan, Italy came his way: "'Michael Goland at Buena Vista offered us the chance to play Vegas. We decided to go to Italy instead. A lot of carrots were waved under our noses - movies, television. We had a lot of diversity with Mike DeVivo and Pete.'" The band was all set to go, but at the last minute, Pete could not make it. Newly engaged, he decided to stay behind. John replaced him with another guitarist, who, unfortunately, did not work out. John contacted Pete, who took the next available airplane to Europe to rejoin his band. Italian producer, Armando Sciascia spotted the band while they were playing The Olympia Ballroom in Milan. 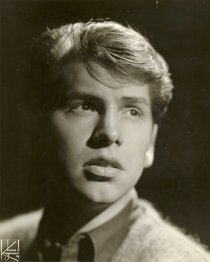 Sciascia recorded numerous sides on the band for his label, Vedette Records. He was instrumental in placing the Chants in Mondo Caldo Di Notte, an Italian movie about the American twist craze. During filming, their name was changed to the American Twisters. Sciascia released their records under this moniker. After the run of recordings and appearances in Europe, John decided he'd had enough and returned to the States. The other members remained behind for a while, but after a time, they too returned to America. Once back in New York, Pete resumed his creative schedule, recording some sides for Amy Records under the pseudonym Jay Walker and The Pedestrians. With so many projects mounting, Pete and John, now his songwriting partner, formed an alliance with two promotion men, Teddy Fagen, who worked for Liberty Records on the west coast and Steve Harris, a New York promotion man associated with Malverne Distributing. Their aim was to take their demos to record companies along Broadway, the strip formerly known as Tin Pan Alley. In 1962, this area was a hotbed of musical activity, catering to this new business of Rock & Roll, with myriads of publishing houses, promoters and both established and ad hoc record labels. For young songwriters, these companies were the conduits to use to introduce their songs to popular performers. Pete recalls how he was suddenly thrust into the spotlight as a solo artist: "We were producing Nick Cardell at the time. At the end of a session at the Stea-Phillips studio, we had ten minutes left. We recorded the demo of 'Night Time' with the musicians singing backup. Steve Harris, a promotion man, took it to Harry Chipitz at Cameo-Parkway." When Harris returned with the news that Cameo wanted to release the demo, Pete was aghast. "They want us to re-record it? Harris said, 'No they want to put it out as is.' Put what out?! This is just a demo!" 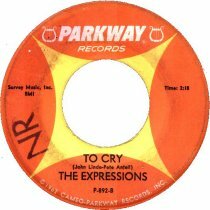 Cameo-Parkway was one of the fastest rising independent labels in 1962, boasting immensely popular artists as the Orlons, Bobby Rydell, Dee Dee Sharp, Chubby Checker, the Dovells and Jo Ann Campbell in their stable. Harris played the demo of the song Pete had recorded. The senior gentlemen at the label flipped for the simplistic, yet effective ballad. The makeshift backing vocal group was assembled from the studio musicians at Stea-Phillips, and, according to Pete's account, were certainly not singers. Pete's sentiment was that the backing harmonies were off, but when Cameo Records says you have a hit, you have a hit! 'Night Time', the reluctant single with the raucous backing vocals, sailed into the charts in late 1962, hitting big in New York City, entering the WABC music survey at #28 and staying on the New York Top 40 list for 8 weeks. The result was a national chart entry and a significant hit in many local regions, including New York, Philadelphia and Pittsburgh. 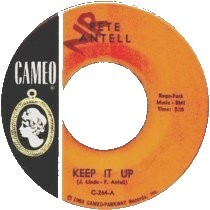 For the second Pete Antell single, Pete and John provided Cameo with the wild, country-flavored 'Keep It Up'. This established an ongoing association with Cameo/Parkway as independent writers and producers who could supply the label with premium product. 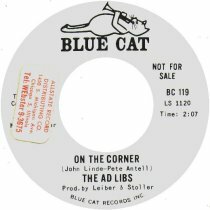 Besides Pete's two singles, he and John placed records by two singing groups comprised of fellow Long Island natives. 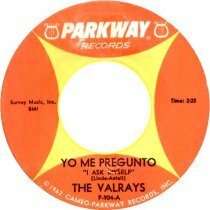 The Valrays released two singles for Parkway, the Beach Boys-flavored 'Get A Board' and 'Yo Me Pregunto (I Ask Myself)'. 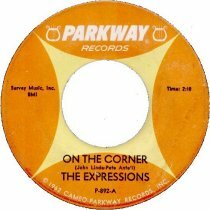 The Expressions, formerly the Imaginations with lead singer Bobby Bloom, released 'On The Corner', later covered by the Ad Libs. Out of all these singles, 'Yo Me Pregunto' made significant inroads into the charts. John had been influenced by Spanish music while playing at The Copa. The decision for Spanish lyrics was a result of that influence and Pete's dissatisfaction with the sound of the English words. 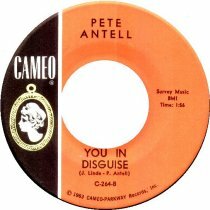 In addition to the records they were producing for Cameo/Parkway, Pete and John formed their next lucrative alliance with another Long Island ensemble through an associate at Ultra-Sonic Studios. Keyboard player Stoney Jackson had worked with this quartet of young ladies who called themselves the Percells. Stoney recommended the outstanding group to Pete and John. 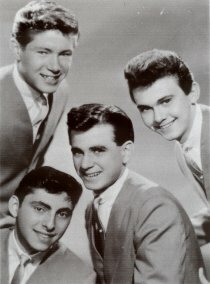 Bill Stahl, the owner of Ultra-Sonic, also knew of the quartet's vocal prowess. When the songwriters heard the Percells at the studio one night, they liked what they heard. Immediately, plans were made to record the Percells. The first Percells session was a tune created out of an old saying, 'What Are Boys Made Of'. The song begins with unison vocals, halting momentarily, then taking off at a galloping pace, accompanied by a quick-playing piano, courtesy of Pete, and blaring saxophones for the bridge. The group sings together on the title refrain and Gail takes her emphatic, sassy lead during the verses. This breathless production made it to #53 on the pop charts (#17 R&B) in the spring of 1963, also reaching the top 20 in Canada. Its flip was a sweet, wistful ballad entitled, 'Cheek To Cheek' with flawless unison vocals. This song is Joan Paulin's favorite: "I really liked that song because I could really hit a high note. 'Cheek To Cheek' was very sweet to me." ' netted the group an appearance on American Bandstand and lives shows at the Brevort Theater with the Dovells, at Shea Stadium with Dee Dee Sharp, and a spot on Jocko Henderson's Rocket Ship Revue at the Apollo Theater, on a bill with Ruby & the Romantics, the Chiffons, the Chantels and Bob B. Soxx & the Blue Jeans. The Percells were now included in John and Pete's camp of premium hit makers. With just several days notice, Pete and John wrote and recorded a jingle using the Percells, Expressions and Valrays. This jingle was for famed New York deejay Bruce Morrow, then with WABC. 'Cousin Brucie', still on New York radio, uses the jingle to this day. 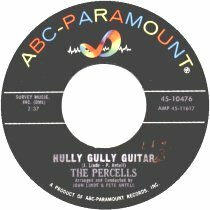 The Percells even backed Pete on a song called 'It's Your Birthday', a tender tune that he wanted as the follow-up to 'Night Time'. Cameo, unfortunately, didn't care for it. ': "the record company was screaming for a follow-up, so we gave them what we had." Pete sees this differently: "I really loved the record - different, yet The Percells' sound and style." The flip, 'Boyfriends', features Jean Marie on the response lines with Gail. This ballad's melody line comes straight from Pete's own 'Night Time': "We figured we wouldn't get into trouble if we stole from ourselves." and they did it so well!" The ambitious producers had high hopes for this record, thinking it would go really far. John's hopes were dashed when the record floundered: "I thought that we were going to have a number one record with 'The Greatest'. I really feel it could have gone all the way. It was the fourth release. If it was the second or third, I think that it would have been on the play list with all those groups that bring back that era." Pete feels that much of the responsibility rested with the record label, ABC-Paramount. 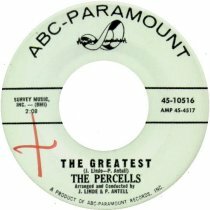 The company simply did not do everything to promote the Percells' recordings. 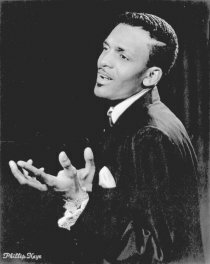 The company's main interest was with all the proven artists that they had signed at the time, artists like the Impressions, Ray Charles and Fats Domino, as well as Tommy Roe, the Del Vikings and Eydie Gorme. ABC-Paramount was also a distributor, so it is much more surprising than usual that they didn't push their entire catalog. After the last session with the Percells, John and Pete turned their attention to other projects, always meaning to follow up on the Percells, but never being able to: "I feel that we made a mistake in not recording them further. We didn't mean to stop recording them, we just didn't record them again. We were writing and producing almost like machines. We would get very excited about the next project, the next baby, and not take care of the babies that were already born." Pete and John stayed busy producing former Chant, Mickey Lee Lane, on Swan Records. Mickey had a hit with 'Shaggy Dog'. They also wrote and produced two singles, 'The Plan' and 'Fourteen Getting Older', for an ad hoc group called the Trains, a name given to them by John as he drove alongside the Long Island Railroad on his way home. 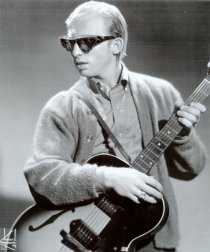 Bobby Bloom had sung the demo, but John supplied his lead for the release on Swan Records. In 1965, Pete started his own label called Bounty Records with Elektra Records owner Jack Holzman. 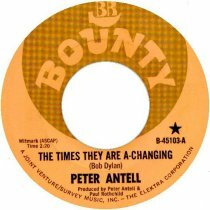 Hearing something special in a young folk poet named Bob Dylan, Pete recorded and released a version of Dylan's 'The Times They Are A-Changin'' with co-producer Paul Rothchild. He was also recording a promising new artist named Bobby Coleman, who had started his singing career as a member of the Blenders, a non-recording group who also hailed from Long Island. Unfortunately, two weeks before the record was to be released, Coleman was killed in an automobile accident. 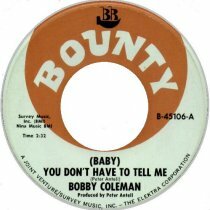 Bobby's wonderfully atmospheric '(Baby) You Don't Have To Tell Me', was released, but nothing was done to promote it in light of the circumstances. 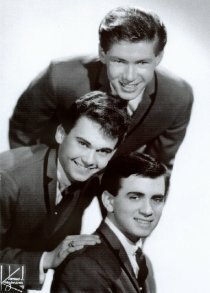 The song was later recorded by the Walker Brothers. 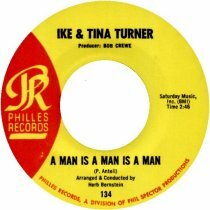 During the same time Pete worked with Bob Crewe, supplying 'A Man Is A Man Is A Man' to Tina Turner for one of her Philles 45s and recording as an artist for Crewe's New Voice label. His stellar single 'Warm Smoke' is a much sought-after collector's item. John worked for a time with Leiber and Stoller, then began a six-year association with Kama-Sutra Records, where he was responsible for bringing in a young piano player: "I brought Billy Joel to Kama Sutra. He was a smart Alec." Today Jean Marie Johnson lives in Orlando, Florida. Betty Lloyd married a member of Ruby and the Romantics' band and is settled in Cleveland, Ohio. Joan Paulin Ellis remained in Hempstead to raise her family. She retired from Verizon in 1991 and is currently working part-time. Joan is excited by the fond memories she has of her tenure with the Percells: "The sixties were wonderful! Singing and traveling is something you will never forget." Gail Jones Houston re-entered the music business in the 1980s, devoting her time to singing gospel music, working with notable ensembles such as the Gospel Experience Choir and the Art of Living Voices. Gail has also sung and acted for the Creative Performing Institute. She currently works as a production assistant with an audio/visual company and recently formed Houston Unlimited, a video and movie production company. Gail has also finished a new CD of inspirational music with British producers Philip Henry and David Patrick. John Linde kept himself busy producing Vanilla Fudge with Shadow Morton ('The Beat Goes On'), and with Bandana Productions with Dee Anthony. At the dawn of the 1970s, John moved out to California to establish some musical projects. He mixed and mastered Emerson, Lake and Palmer, the J. Geils Band, Humble Pie and King Crimson. Over the years, John moved his family east again, settling in Florida. In 1987, under Quest Studio Productions, he produced and wrote the screenplay for Before God, his first independent production for Universal. Most recently, he and former Valray Rod McBrien have been writing and producing half-time shows for Florida's Orange Bowl and Fiesta Bowl. John also writes film scores and tends to his restaurant business with his sons. 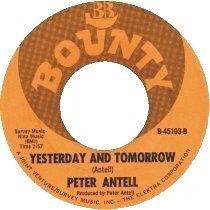 Peter Antell stayed on the east coast, writing songs and forming new acts. He has his own orchestra, which can be seen in the Woody Allen movie Crimes And Misdemeanors. Pete is still actively engaged in writing songs and recording. Photos supplied by John Clemente and Peter Antell. Label scans supplied by Martin Roberts and Mick Patrick.